Today is the Feast of St. Ephrem. He is one of the more obscure of the saints (except perhaps in the Syrian church). I sense this relative obscurity does not trouble St. Ephrem in his heavenly home in the least. However his spirituality has much to teach us today. His legacy is shared in virtually every parish and church in the world every time we worship our Lord. St. Ephrem (306-373 A.D.) was one of the first doctors of the Church in spite of his relative lack of schooling. He was, however, deeply schooled in the Scriptures that resulted in powerful insights into the mysteries of God and in sharing Godly wisdom. St. Robert Bellarmine wrote of the saint that he was; “more pious than learned”. It was this piety, rooted in God’s Word, and prayer that brought forth a harvest of wisdom and teaching. 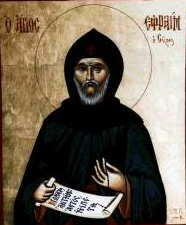 St. Ephrem was a prolific writer and teacher. He expressed this fruitfulness usually in poetic form. He wrote many ancient hymns. It was this early ‘troubador of the Lord’ that is credited with introducing sacred song into Christian public worship. In many ways he was a saint in the model of St. Francis of Assisi. His intense appreciation of the Passion of our Lord, humility, love of Scripture and relative poverty of worldly learning were all precursers of St. Francis. St. Ephrem, relatively late in his life, was ordained a deacon in the Church. For me, all deacons, and all the faithful he is a real and practical example of learning and living the Gospel of Christ. St. Ephrem, pray for us that we may learn and live the ageless wisdom and power of God’s Word. Amen.